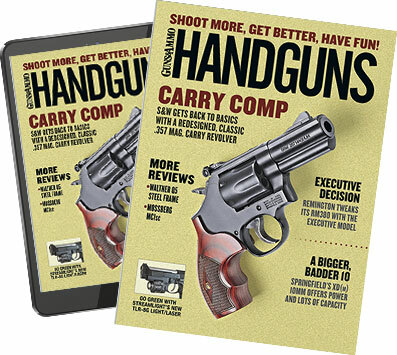 I've never felt handicapped with a six-shooter (or even a five-shooter) because I've trained with revolvers for so long that I can reload pretty damn fast with conventional HKS speedloaders. I'm no Jerry Miculek, but I don't look like a spastic monkey, either. I've been pretty happy toting my extra ammo in an HKS speedloader or Bianchi Speed Strip all these years, but my recent rediscovery of full moon clips has really sped up my wheelgun reloads. A full moon clip is circular piece of spring steel or stainless steel designed to hold a cylinder of revolver ammunition together as a unit. Unlike speedloaders or Speed Strips, the entire unit is inserted into the cylinder to load the weapon, and it remains there until you eject the cases, at which time the entire unit is ejected. That ability to load and unload the entire cylinder at once is the main reason moon clips are so darn fast. Ejecting empty cases as a unit is more positive and reliable than ejecting them individually, too. Moon clips aren't a new invention. In fact, the first ones came out shortly before World War I. They were designed to allow revolvers to chamber military issue .45 ACP ammo because there was a shortage of 1911 pistols and an abundance of .45 ACP ammunition. Smith & Wesson developed the Model 1917 revolver, which chambered the .45 ACP and used moon clips, for that role. Moon clips' popularity faded fast with the proliferation of semiautomatics. A 9mm Ruger and Smith & Wesson revolvers chambered for 9 mm, .40 S&W, 10 mm or .45 ACP employed them, but none of those guns fared well in the commercial market until the late 1980s. That's when moon clips began to make a comeback thanks to revolver-specific competitions where S&W's 625 fast became the king of the wheelgun hill. Later, famed speed shooter Jerry Miculek's freakishly fast reloads made the clips even more popular. I have always associated moon clips with rimless cartridges such as the 9mm and .45 ACP, but the most popular moon clip conversions these days are done to revolvers chambered for conventional rimmed cartridges like the .38 Special and .357 Magnum. But unlike rimless cartridges where the clip is part of the ignition process, moon clips are simply carriers for rimmed cartridges. Converted revolvers still work just fine without them. My rediscovery of moon clips came when I received a customized Ruger GP100 revolver. I used to have a 625 so I am somewhat familiar with using S&W's moon- and half-moon clips, but the speed with which I was able to reload with my new Ruger was surprising. After two weeks of practice, I was getting really fast. I was nowhere near Miculek fast, but the gap between my semiauto and revolver reloads was getting slimmer by the day. I finally hit the wall a few months ago, and I doubt I'll get any faster, but I am very pleased with the extra speed I picked up with my moon clip conversion. I touched on the significance of moon clipped rounds loading and unloading as a unit earlier in this article, but its importance cannot be overlooked. When loading, you don't have to fiddle with buttons or knobs—simply drop the rounds in and shut the cylinder. They are even more helpful during the unloading process, where the improved purchase the clip provides makes ejection pretty much a sure thing. In fact, I've never had a moon clip hang up or fail to extract. Their compact size is another reason moon clip reloads are so fast. Because the entire package is no longer than the .357 Magnum loads I'm stuffing in the cylinder, I don't have to maneuver the rounds this way and that to get them in the cylinder like I sometimes do with a conventional speed loader. I know I will probably never need the extra reload speed I gained with the moon clip conversion, but it's nice to know it's there. I've worked with two companies that do moon-clip conversions. One is Gemini Custom and the other is TK Custom. TK Custom specializes in this type of work; consequently, they do a great job and they do it fast. Their current turnaround time is seven days or less. Both companies can do the conversion on most Colt, Ruger, Smith & Wesson and Taurus centerfire revolvers with five, six, seven- or eight-shot cylinders, and they can even do titanium cylinders. TK Custom is also the best place to get moon clips as well as the loading and unloading tools. The tools take the pain and pinching out of loading and unloading the moon clips, and they extend the life of the clips. TK offers a conversion package for $230 that also includes both tools and 10 stainless steel moon clips. Morganti does the conversion with three clips for $145.